"We started building on Jun. 20," says Mohammed el-Sheikh 'Eid, a consultant engineer with Gaza's Ministry of Interior. "Since this is the first time we've built something on this scale with mud bricks, we can't estimate exactly how much longer it will take to complete. Maybe another two months or so." He is confident, however, that they will finish before the winter rains begin. Since the war on Gaza ended, a number of houses have been built using mud to create simple, square, two or three-room homes. The new Sheikh Zayed police station is one of the larger and more ambitious projects. An intricate series of thick-walled, deep-arched chambers form what is on the whole a much more artistic rendition of the former square, cement police station bombed during the attacks. When finished, the station will be 550 square metres, including seven 3.5m by 3.5m office rooms and eight long, arched-roofed chambers 3m wide and 8m long. 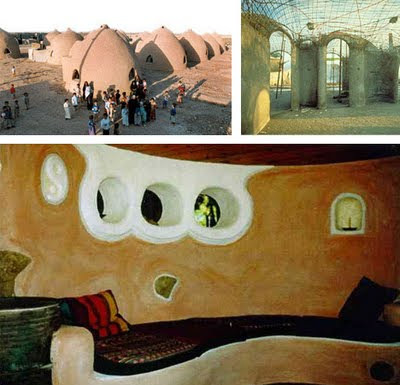 In contrast to Gaza's basic new mud-brick homes, with their cracked-earth finish inside and rough, straw-flecked outer layer, the police station design replicates that of the elegant, traditional Palestinian stone or brick buildings: neatly-packed rows of brick frame windows and doorways in graceful arcs; with surprisingly smooth domes that top off vaulted rooms and corridors. The one-level station, with its multiple rooftop domes, resembles the architecture of Palestinian homes from Nablus to Jerusalem. The site, just off the coastal road serving Beit Lahia, is open and spacious, with a contrasting backdrop of cement block apartment buildings, built long before the Israeli siege on Gaza, when cement was accessible. Engineer and site supervisor Sameh Al-Khalout explains the small-scale and hand-crafted construction process. 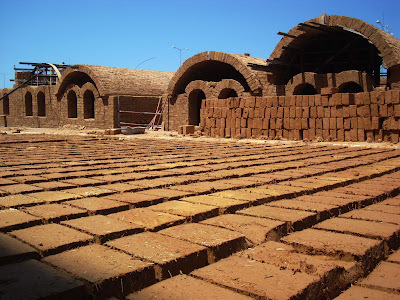 "The mud bricks take between one and two weeks to cast and dry," he says, gesturing at the rows of bricks drying in the sun. "Each brick costs roughly one shekel (a quarter of a dollar) to make." Al-Khalout says the clay is brought from a nearby area of Beit Lahia, and the straw comes from local farmers. "We will put plaster on the roof, to seal it and protect it from rain." Wood is temporarily used to buffer ceiling arches and windows until the clay mortar hardens. The wood is then removed and used elsewhere in the same manner. Apart from these wood bracings, conventional and excessively expensive building materials are not used. Cement smuggled in via the tunnels between Egypt and Gaza is as much as ten times the pre-siege price. A tonne of cement costs 3,400 shekels (850 dollars), compared to the 350 shekels it cost prior to June 2007. Husam Toubil from the United Nations Development Programme says Gaza requires 50,000 tons of cement to rebuild destroyed homes, and 41,000 tons for public buildings. Al-Khalout says problems extend beyond lack of availability of materials. "For most of our workers, this is their first experience building with mud bricks. "Since we have to bring in clay, straw and gravel, and mix the mud cement, make the bricks and then build the actual station, we require more workers than we would using cement." In an enclosed Strip where unemployment is near 50 percent and poverty has reached 90 percent, according to a recent UN Conference on Trade and Development (UNCATD) report, the workers will brave the heat for the chance to earn 40 shekels a day. Since the siege on Gaza tightened in June 2007, almost no construction materials have entered Gaza, according to the OCHA report. This is in comparison to the pre-attacks, pre-siege import levels of 7,400 trucks per month, from January to May 2007. According to the United Nations Relief Web news, 3,900 truckloads entered Gaza from January to May 2007. Over the same period this year, six trucks were allowed in. These carried material for water projects, greatly in need and long awaiting completion. The Israeli authorities say the ban on building materials is to prevent Hamas from using so-called "dual use" items for military activities. Yet, non-Hamas run agencies, schools, and healthcare centres are facing the same blanket restrictions on import of cement, gravel, wood, tiles, piping, paint, glass and steel bars, notes the OCHA report. The mud brick technique, extended beyond the simple clay ovens prevalent in Gaza to the building of houses, potentially meets some of Gaza's great construction needs. East of Gaza city, in the Al-Shojayia district, engineers have tackled the challenge of a multi-level clay-brick building: a three-storey school for 600 disabled children is under construction, using a combination of mud brick and rubble from the remains of homes and buildings destroyed during the Israeli attacks. According to a Guardian news report, engineer Maher Al-Batroukh and university engineers experimented with clay to create strong bricks. When finished, the school will be roughly twice the size of the Sheikh Zayed police station, with similar domed ceilings and plaster coating. Noting the success of clay building endeavours, the Hamas Ministry of Public Works is likewise pursuing the mud-brick alternative, with plans to build multi-storey houses and re-build destroyed public buildings. While some are finding means to get around the Israeli ban on nearly everything needed to re-build in Gaza, the on-going siege on the Strip continues to hit daily life to an extent that the latest UN report notes that closed borders and delays in allowing in goods are 'devastating livelihoods' and causing gradual 'de-development'. The OCHA report further cites the damage to education, including overcrowding due to destroyed or damaged schools, and denied or delayed education materials. In an August 2009 statement, Maxwell Gaylard, the UN Humanitarian Coordinator for the occupied Palestinian territory, noted that the "deterioration and breakdown of water and sanitation facilities in Gaza is compounding an already severe and protracted denial of human dignity in the Gaza Strip." Gaylard, along with the Association for International Development Agencies (AIDA), notes that the Israeli denial of entry of equipment and supplies needed for the construction, maintenance and operation of water and sanitation facilities since June 2007 has led to "the gradual deterioration of these essential services." Further citing destruction from the Israeli attacks, the statement says Gaza's sanitation and water services are on the "brink of collapse", noting that the sparse supplies allowed in have been "nowhere near enough to restore a fully functioning water and sanitation system." About 60 percent of the population does not have continuous access to water, the statement notes. Roughly 10,000 people in Gaza have no access to the water network at all. This, combined with the 50-80 million litres of untreated and partially treated wastewater that is being discharged daily since January 2008, compounds the water and sanitation crisis. Although some resourceful individuals have built homes despite the ban on cement, these various reports highlight that the manifold problems created by the ongoing siege and Israeli attacks on Gaza are too extensive to be solved by improvisation and mud alone. The Palestinian Centre for Human Rights (PCHR) reports that 60 police stations were destroyed or damaged during the winter 2008-2009 Israeli attacks on Gaza. The United Nations Office for Coordination of Humanitarian Affairs (OCHA) August 2009 report says more than 6,400 homes were destroyed or severely damaged, and over 52,000 suffered minor damage from bombing during Israel's winter war on Gaza. The OCHA report notes that the continued Israeli-led siege on Gaza has prevented reconstruction or repair of 13,900 homes, including approximately 2,700 homes damaged or destroyed in earlier Israeli military operations, and of 3,000 housing units intended to replace inadequate homes in crowded refugee camps. Over 20,000 Palestinians remain displaced in Gaza, with approximately 100 families still living in emergency tents provided by aid agencies. PCHR also reports that 215 factories and 700 private businesses, 17 universities or colleges, 15 hospitals and 43 health care centres, and 58 mosques were destroyed or damaged during the attacks. The United Nations says that 298 schools were destroyed or damaged. Also read other interesting stories here. 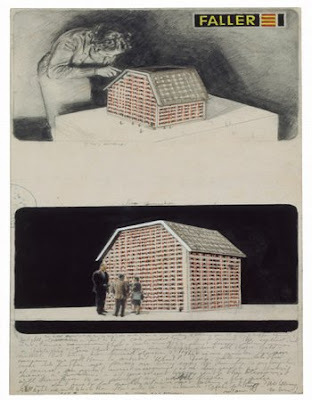 Architecture has been something of an obsession in contemporary art for decades. Back in 1981, the now defunct Los Angeles Institute of Contemporary Art mounted a citywide exhibition, “Architectural Sculpture,” which was both a barometer and a harbinger of the intersection of art and architecture. Read review here! Your excellence, dear colleagues, dear parents and dear students! I feel honored being invited here today. Some 20 years ago I came here as a tourist, and as BUST was opened in 1995 I had the opportunity to speak to you for the first time. 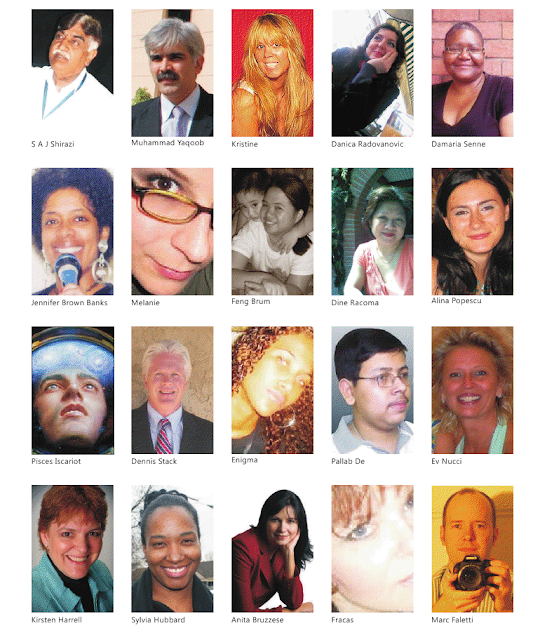 Since 2001 I am voluntarily working together with CAT (Centre for Appropriate Technology). So I may be familiar to some of you. The parents are harvesting the fruits of their financial givings, and the students profit from a profound education. A latin saying is: "We do not learn for our school, we learn for our life!" Non scholae sed vitae discimus. Today we live in a world of "lifelong learning" - which some of our ancestors were familiar with decades ago. All people should have the opportunity to cultivate their personal abilities. Men and women are equal,- means the western thinking. Looking at our planet from a distance, this may be true today. But looking at the way most of us design our lives today reveals some adverse aspects. It seems the demand for focusing on elementary ecological and sociological concerns still remains a challenge. My dear students, you have worked hard, but life has not quite begun. You will have to face the fact that learning must continue. Your future calls for linking your earned skills with the demands of our modern society. You will have to take the challenge to survive in an environment focusing on industrial and monetary aspects, turning motivated individuals into exchangeable merchandise. Developing and preserving values based on theoretical knowledge with little practical experience will require strong personal ethics. Your initial effort will not pay well, nevertheless you should keep building practical experience in projects, even if that may mean working voluntarily. I wish you all the best for your personal future. 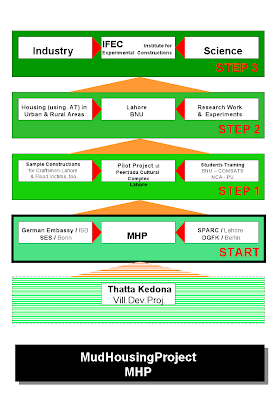 The MHP was initiated through SPARC (local NGO) in 2010, but it has a history, which began in 1990 in a village development project (Thatta Kedona) in the district of Okara (Gogera) in southern Punjab. The mud construction has a long tradition (Harappa) in this region and it is still used extensively in the rural areas. However it has not developed further due to the influences of the city culture. Double storeyed mud constructions are however found very seldom. This although mud housing has many positive-construction biological properties and it is much more energy efficient than constructions of baked bricks and steel concrete. Purpose of the MHP is to emphasize the usefulness and importance of mud construction in city development. 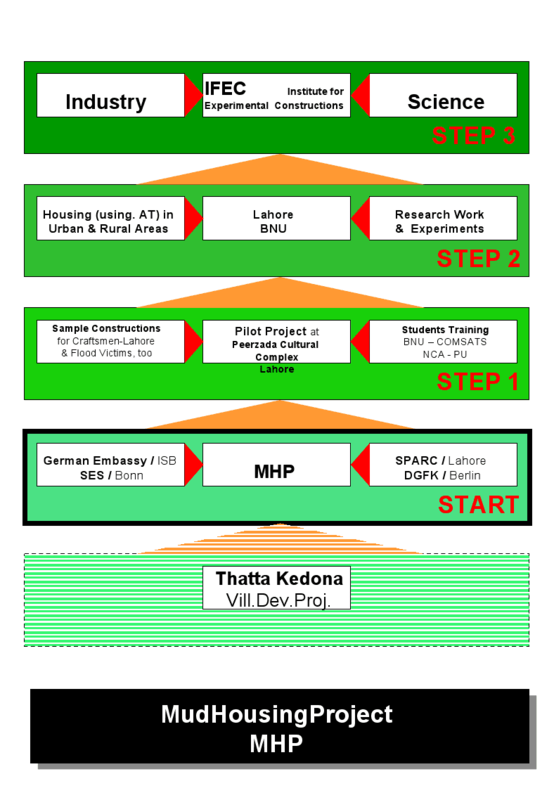 In cooperation with SPARC and the DGFK (german NGO's), support through the SES (Senior Expert Service) in Bonn and the German embassy in Islamabad was obtained. The MHP has gained additional importance due to the consequences of the recent floodings in Pakistan. Help is necessary. Financial means are to be used effectively, local solutions are to be found, the daily requirements (e.g. hot water, cooking, etc.) are to be considered. 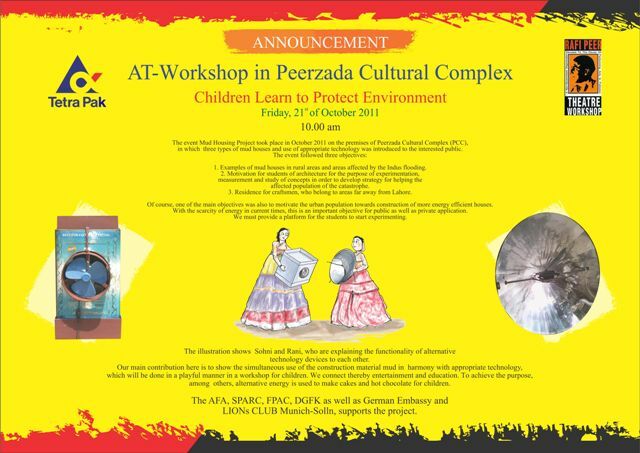 Possibilities of using Appropriate Technology are to be explored. The MHP should be understood as the initial flame and its aim to urgently establish a facility for experimental construction, which requires availability of suitable piece of land. For various reasons, the implementation has to done in steps. The first steps have been taken.